Our "Land of 1000 Lakes" allows you to experience the last great freedom in flying. There are no concrete slabs that dictate your landing, no noise from radios and no worry about "busting" an airspace. You will be able to devote your time to the "Back to Basics" of flying (stick and rudder and head out of the cockpit). There is no doubt your land plane flying skills will be improved after flying our seaplanes. Come let one of our professional instructors acquaint you with the most fun you'll ever have in flying. Pilots flying in can land at Winter Haven's Gilbert Airport at taxi over to Jack Browns. We also have information on getting your Multi-engine Seaplane rating - see link below. Operating year around in the perfect climate of central Florida, U.S.A., we train you from the bottom up, or just upgrade your ticket. Since 1962, Brown's have trained over 14,000 seaplane pilots from all over the world. Mr. Brown chose the central Florida area as the location for his base because of its abundance of freshwater lakes and superb flying weather. Classes start Monday through Saturday. Sunday is used to finish anyone that was not able to finish on Saturday. A $300 deposit is required to hold a start date. They can train 2 pilots at a time. Visit Flymall's "Buyers Tools & Information" under our "Aircraft Sales" section for more info on seaplanes. Tell them you saw this on Flymall.org Please bring the following when you arrive for training: - U.S. Pilot License - Current VALID Medical Under 40 years of age, medical good for 60 months, 5 years. Over 40 years of age, medical good for 24 months, 2 years. - Passport or Birth certificate and driver’s license (photo ID). - IACRA registration information: FTN number, user name and password. If not registered with IACRA please go to the following web site to do so. See below for more information on IACRA. 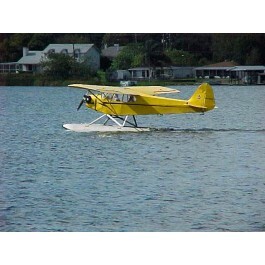 Click here to order seaplane training material - search for "Seaplane"